IT WOULD have been Peggy Jay’s 95th birthday on Monday, and so it was fitting that so many friends and family members who had come to pay their respects turned her funeral into a celebration of long, successful and happy life. Hundreds of mourners packed the pews of Hampstead Parish Church – where Peggy had married her husband Douglas in 1933 – and then filled Burgh House in New End afterwards for a wake. The house would have been sold off by Camden Council in the 1970s were it not for Peggy’s valiant efforts to keep it in public ownership. 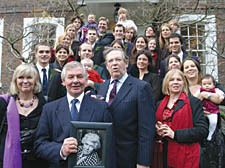 Among the guests swapping rem­in­iscences of the political campaigner, proto-environmentalist and matriarch of the Jay clan were Tory politicians Peter and Virginia Bottomley, the Heath and Hampstead Society’s ­chairman Tony Hillier and singer and Hampstead and Highgate music ­festival organiser Helen Marcus. ­Others at the service were Burgh House Trust chairman Matthew Lewin, and the New Journal’s literary editor Illtyd Harrington, who worked with Peggy at the Greater London Council and City of London’s Hampstead Heath committee chairman Bob Hall. Her son Peter Jay, the former UK ambassador to America, led the ­eulogies. He spoke of his mother’s dedication to her family and the ­community of Hampstead. And he revealed that Peggy’s final months were ones of joy, including a trip to the Isle of Wight, where she had spent annual family holidays. He said: “Peggy had thought much about death recently. Never fearfully, but with emotional intelligence. ever-absorbing subject of her marriage and having had one last precious week in the Isle of Wight. He listed her achievements ­politically, which he said ranged from working to help abolish the 11-plus, stopping the practice of splitting up homeless families, campaigning to ensure hospitals no longer denied access to parents while their children were patients, setting up One O’Clock clubs to help mothers with young ­children feel less isolated, changing health policies regarding the treatment of people suffering from mental ill-health and the way children with ­disabilities were treated, preserving Hampstead Heath and its borders from development, and stopping McDonald’s from opening a huge restaurant in the heart of Hampstead in the shop which is currently Waterstone’s. He also joked about her influence. He spoke of a time when as a young naval officer he had missed an ­interview regarding a possible ­promotion as he was laid low with German measles.